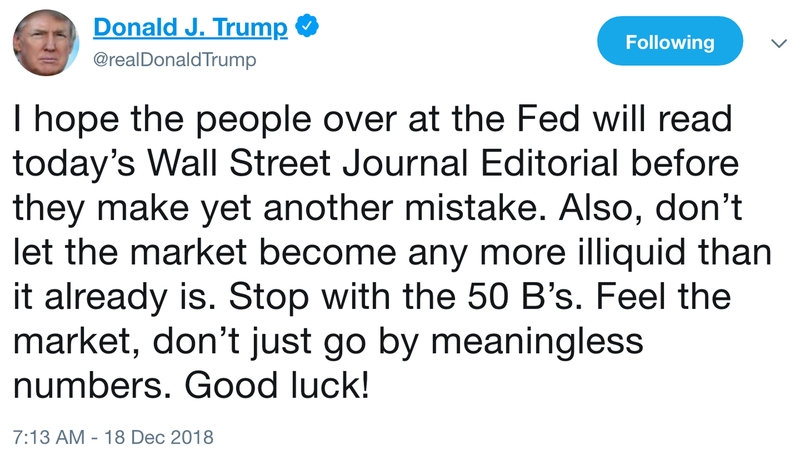 President Trump doubled down on his criticism of the Federal Reserve's expected interest rate increase in a Tuesday morning tweet, urging it to "feel the market" before it makes "another mistake." "I hope the people over at the Fed will read today’s Wall Street Journal Editorial before they make yet another mistake. Also, don’t let the market become any more illiquid than it already is. Stop with the 50 B’s. Feel the market, don’t just go by meaningless numbers. Good luck!" The big picture: The Journal's editorial board issued an op-ed last night that largely agrees with Trump's position, counseling Fed Chair Jerome Powell to "follow the signals that suggest a prudent pause in raising rates." It added, "Get the monetary policy that best serves the economy, and the politics will work itself out. Get the policy wrong, and Mr. Trump will be the least of Mr. Powell’s political worries." The WSJ editoral board's op-ed echoes another WSJ piece this week by Stanley F. Druckenmiller, chairman and CEO of Duquesne Family Office, and Kevin Warsh, a former member of the Federal Reserve Board who is now a distinguished visiting fellow in economics at Stanford University’s Hoover Institution, that says the Fed is poised to make a policy mistake if it raises interest rates this morning. "We believe the U.S. economy can sustain strong performance next year, but it can ill afford a major policy error, either from the Fed or the rest of the administration. Given recent economic and market developments, the Fed should cease — for now — its double-barreled blitz of higher interest rates and tighter liquidity." The backdrop, from Bloomberg: "[W]ere policy makers to follow through with their widely expected hike Wednesday, it would be the first time since 1994 they tightened in this brutal a market." The bottom line, via Axios' Courtenay Brown: There's little the Fed can do on Wednesday that won't bring more criticism — whether it be about its political independence or an imminent policy mistake.